Please refer to our stock # CJ0070 when inquiring. Nice vintage souvenir skating pin from the 1953 Ice Capades. 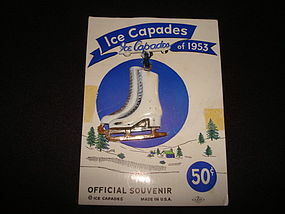 This vintage plastic pin was a official souvenir of the 1953 Ice Capades and comes with it's original attachment card. There are a few small paint blemishes on the plastic skates due to storage, but overall this pin is in fine condition. The pin measures 2 1/4" in height and 1 1/2" wide.